This is Feeling Blue. 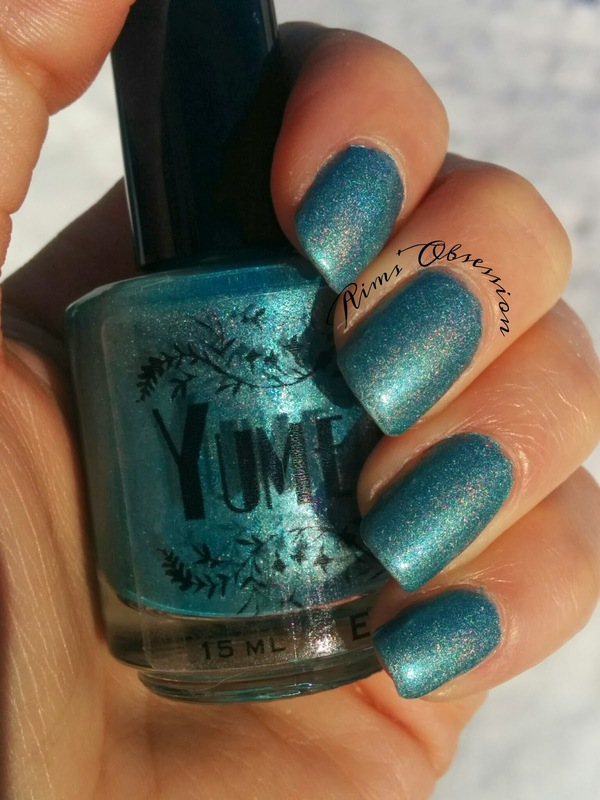 Feeling Blue is an ultra holographic thermal polish that changes with cold temperatures. Depending on how many coats of polish you apply, Feeling Blue can start out a sheer whitish color or a very light blue and changes to a deep blue when cold temperatures hit. Feeling Blue goes on very sheer just like the RWT thermal I posted a little while ago. 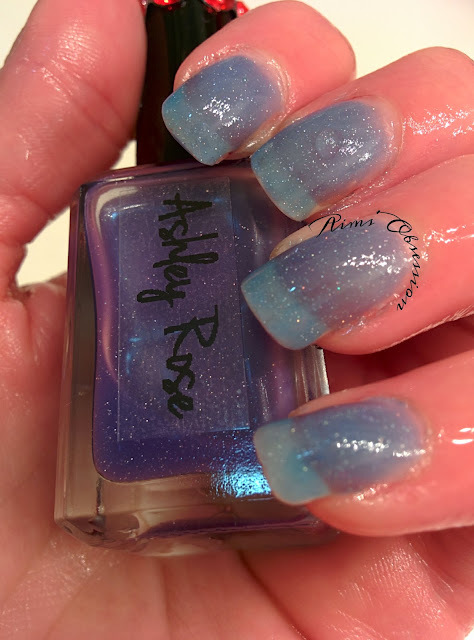 Like the RWT polish, I love the fact that Feeling Blue goes on so sheer because you are able to pick how opaque you want your polish to look. Being a fan of blue polishes, I wanted my mani to look more light blue than the silvery white color I would have achieved if I only used 1 or 2 coats. To achieve this look I applied 4 coats of polish. 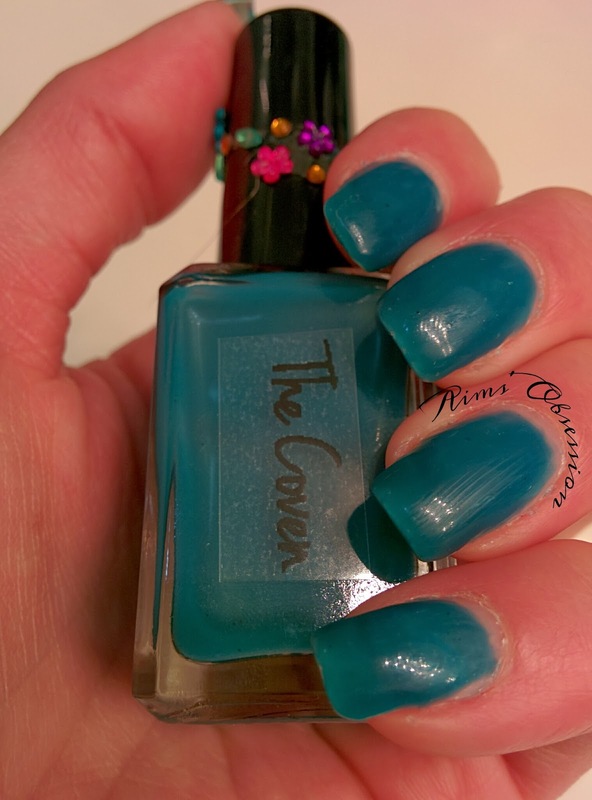 Look at how gorgeously deep blue the polish turns when it is cold! So in love with all of La Bella Vernice thermal polishes. <3 If you would like to see a video of the thermal change in action, swing by my Facebook page! Feeling Blue can be purchased from the La Bella Vernice website for only $10 for a full bottle! Go check it out and while you are there take a look at the other Mood Swing collection polishes! MEAN GIRLS!!!! I don't know about you, but I love the movie and can quote so many parts. LOVE IT! A glitter topper! 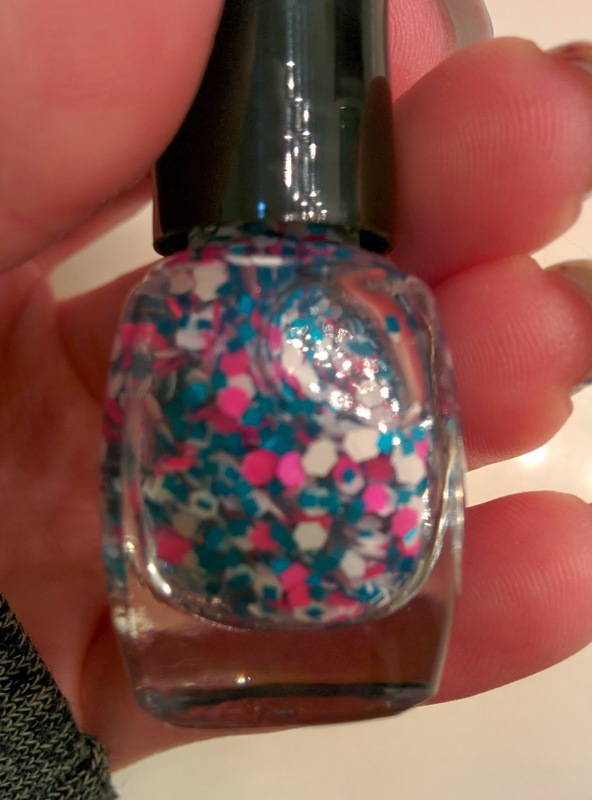 Don't worry about having to fish around for glitters with this polish. The larger brush pulls so many glitters out with each dip you will not be disappointed. 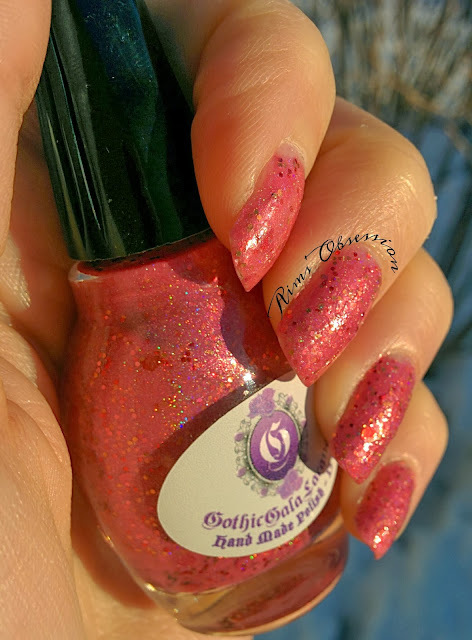 If you are interested in purchasing this glitter topper or checking out some of the other Mean Girls collection polishes from La Bella Vernice, be sure to swing by her website tomorrow for the release! Ruby White Tips Bat Packers Unite!!! I am part of a wonderful group of Ruby White Tips lovers and we call ourselves the "Bat Pack." If you are familiar with Laura's polishes of Ruby White Tips you know that a lot of the sales profits go to Bat World Sanctuary. Pretty awesome right? 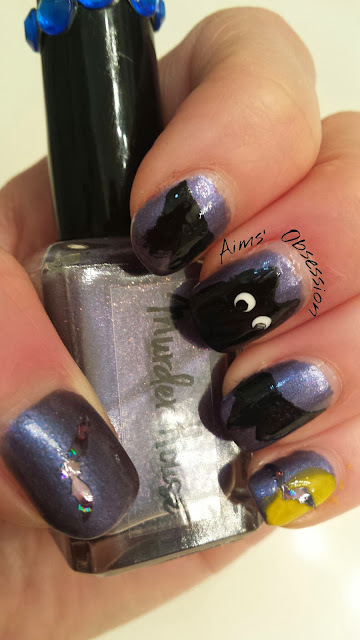 Well we all got together and had a nail art competition where we all came up with bat manis! One of the rules was that you of course had to use a RWT polish as the main color. It was really cool to see what everyone came up with. I used Ruby White Tips- Murder House from the American Horror Story line as my main background color. It reminds me so much of the night sky. 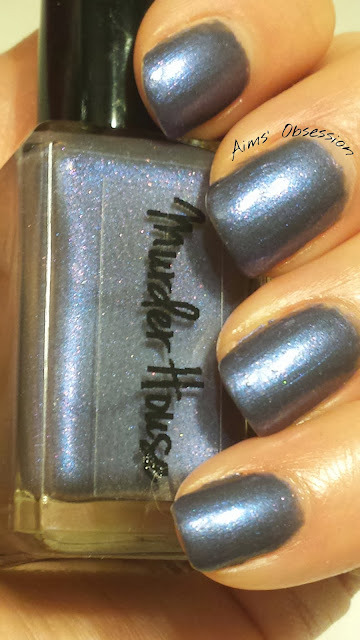 Murder House is a gorgeous midnight blue with a red shimmer to it. (It was a sneaky little bugger to photograph, but super beautiful). 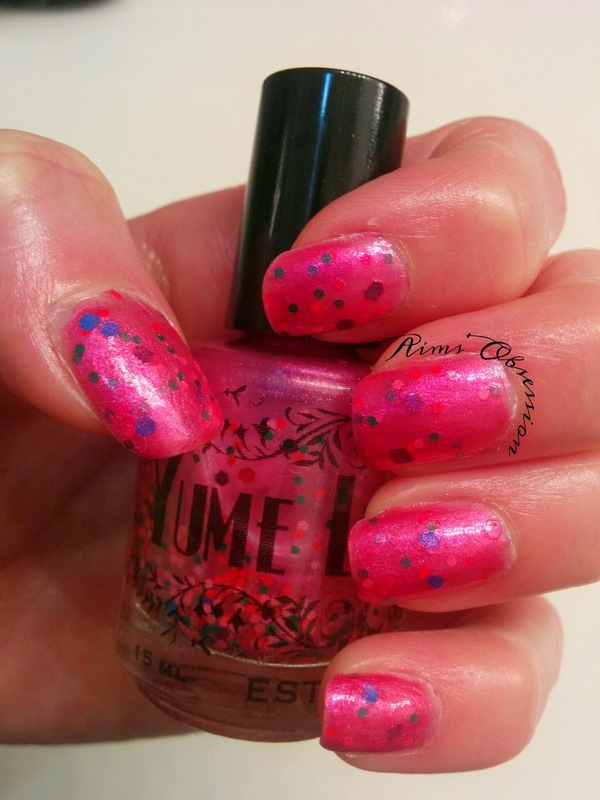 You can find my whole review of this beautiful polish here. Murder House is available for purchase for $9.75 on the Ruby White Tips etsy page. I also added in some cute bat stickers. 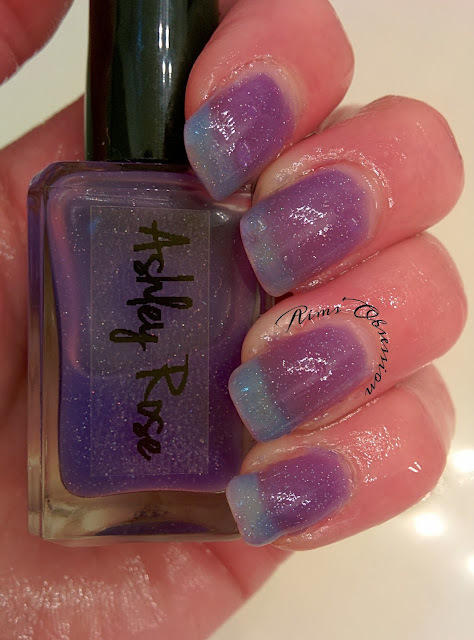 Check out my friend and fellow blogger: Lady Maid Nails' website for her version of a bat pack mani using RWT Kim as a base color. :) It is gorgeous!! If you remember a little while back I was openly super ecstatic about Laura from Ruby White Tips coming out with an American Horror Story line of polish. I am a HUGE American Horror Story Fan. I also love Ruby White Tips. Of course I needed to buy some! 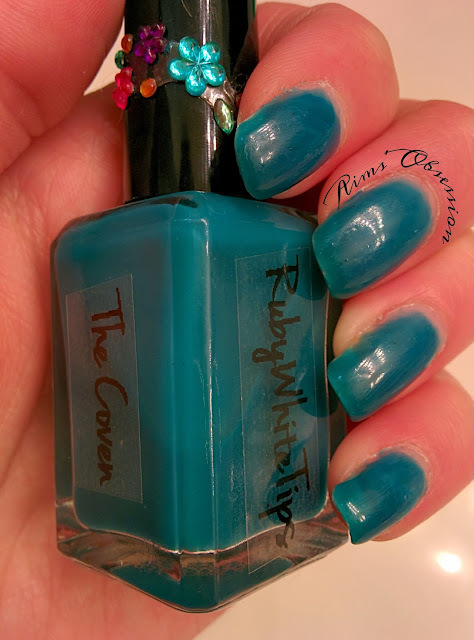 The Coven is a gorgeous teal color that goes on so smooth and leaves an almost gel like look. I had people asking if I went and got gel nails put on. NOPE! 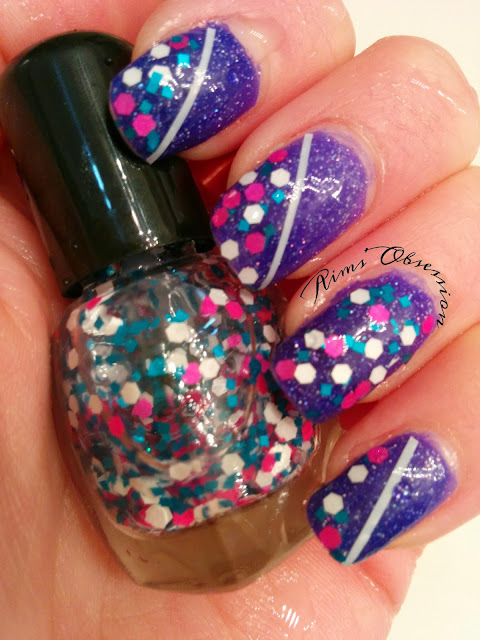 :) This look was achieved with two coats! The listing for "The Coven" states that this color was supposed to be a thermal polish but does not appear to change color. I tried and failed as well. I was SOOOOO determined. Sorry guys! The gorgeous teal color more than makes up for it though. I have also heard that it does change on art projects (someone was polishing glass pebbles). If you end up purchasing this polish please feel free to post your mani pictures to my wall on Facebook! I would love to see them! 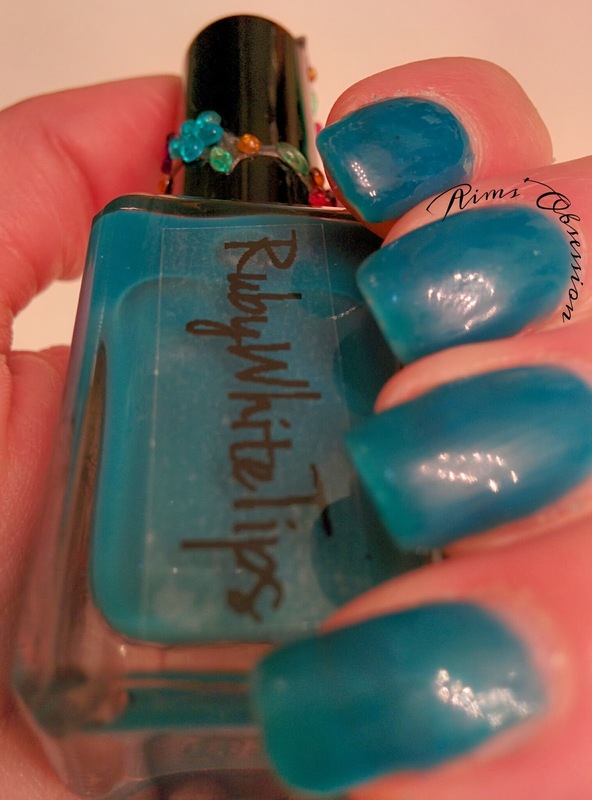 If you remember a while back Ruby White Tips had an imagine the polish of your dreams contest and my idea was chosen. 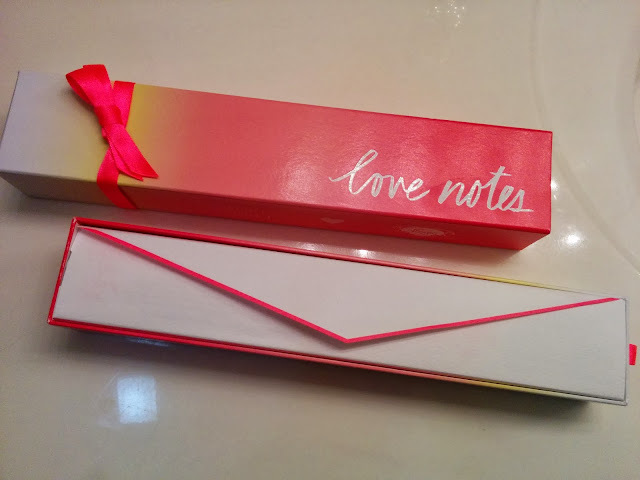 Well, so was a fellow blogger Potions in Motion's idea! Anyway, Laura made both of our ideas and I could no resist this gorgeous polish that Ashley thought up! Naturally I had to make it part of my collection. Ashley Rose goes on very very sheer. To achieve this look I had to use 4 coats. Which actually wasn't too bad because it dries fairly fast. 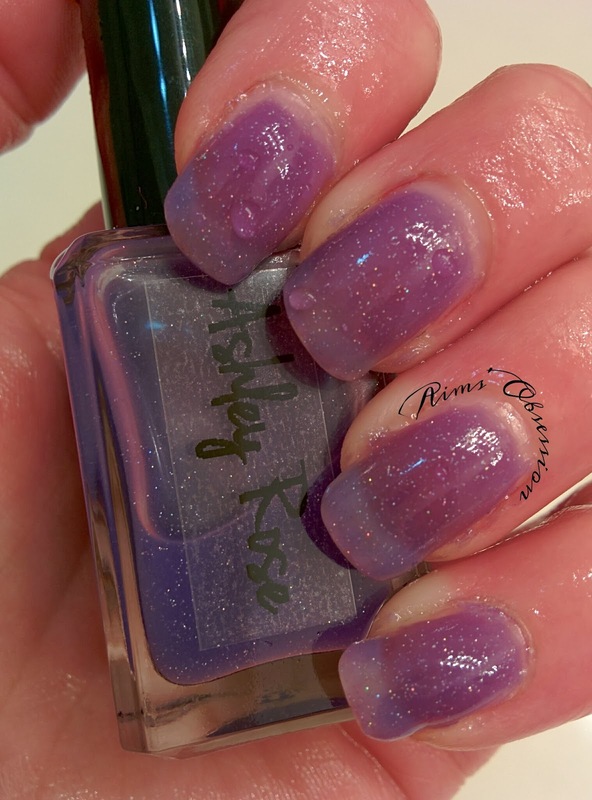 Another plus to how sheer Ashley Rose goes on is: you can pick how opaque you want to make it look. If you are going for a more subtle and sheer look then polish with less coats. It really is a delicate and lovely color! Ashley Rose is a 5 free polish and is also vegan. Laura states in the listing for Ashley Rose that the manufacturer of the thermal pigment says the thermal shift does have a shelf life of one year though. (I believe this is standard for most thermals!) So just be warned that if you plan on wearing it a couple of years down the road. . . it may not shift. The delicate purple is gorgeous anyway! I love this color so much, I'm sure mine won't last the whole year. 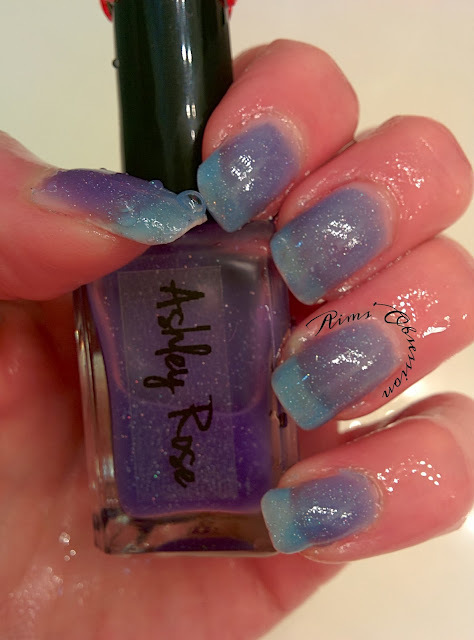 Here Ashley Rose is with the full shift to blue. Both shades this polish transforms to are absolutely gorgeous. I had a blast playing in the water with this polish. Check out my Facebook page for a video of the shift in action! P.S. 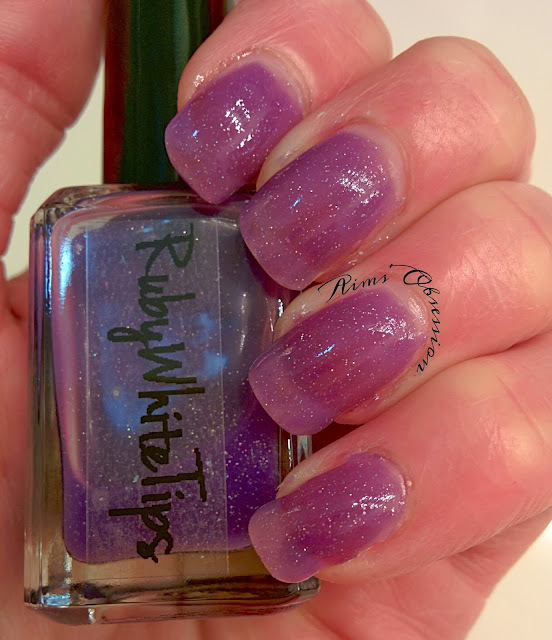 While you are there take a look around at some of the other gorgeous polishes that Ruby White Tips has to offer! The first thing that I noticed and love about this brand is the unique bottles. I love the long slender handle. I believe the bottle really fits the brand's name well. It reminds me of a corset! Would you agree? This is Floor 500. It is a black base polish with a purple shimmer/shift to it. Inside it looks very black but out in the sun. . . magic. <3 I was in love with this polish already but as soon as it hit the light. . . I fell harder. I acheived this look with 2 thin coats. If you polish your nails a little thicker then I would say you could probably get away with applying only 1 coat. 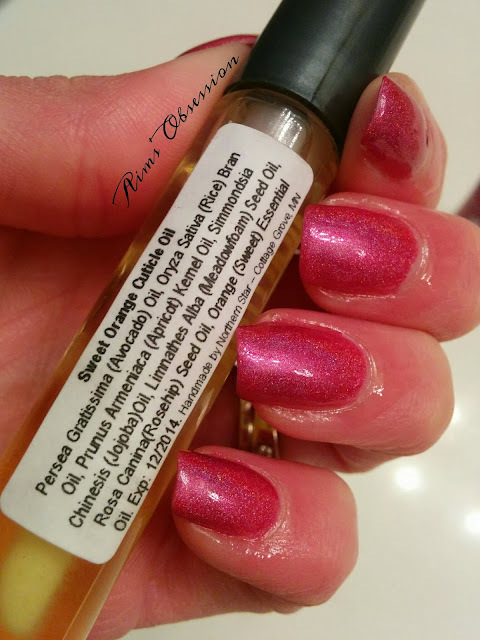 Unfortunately, I looked in the etsy store for Floor 500 and did not find this polish listed anymore and I'm not sure if it will be listed again. :( I consider myself very fortunate to own it! 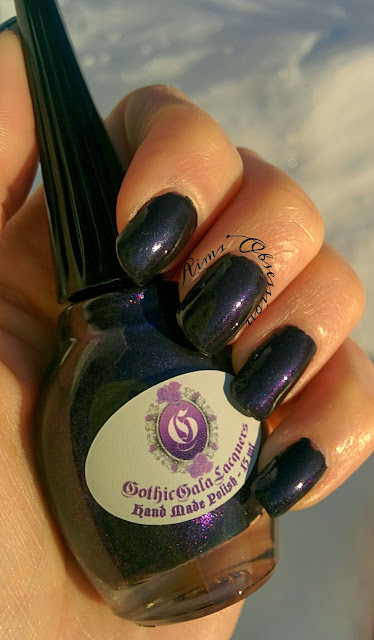 The next polish however, is available on the Gothic Gala Lacquers etsy site!! OMG again with this beautiful bottle! This is Rose & the Dalek. 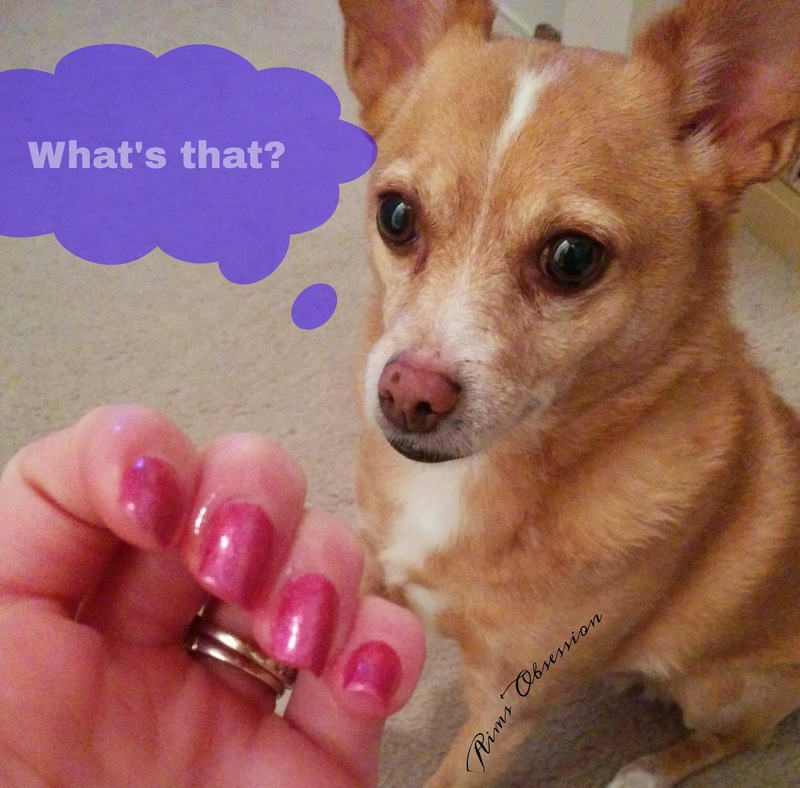 I really love the pink color to this polish. Sadly, this was the best sun shot I could grab this morning on the way to work (and the sun wouldn't cooperate afterwards!) You can see a hint of holo on the bottle. The polish really sparkles in the sun. I'm sorry that I couldn't capture it in my rush out the door! 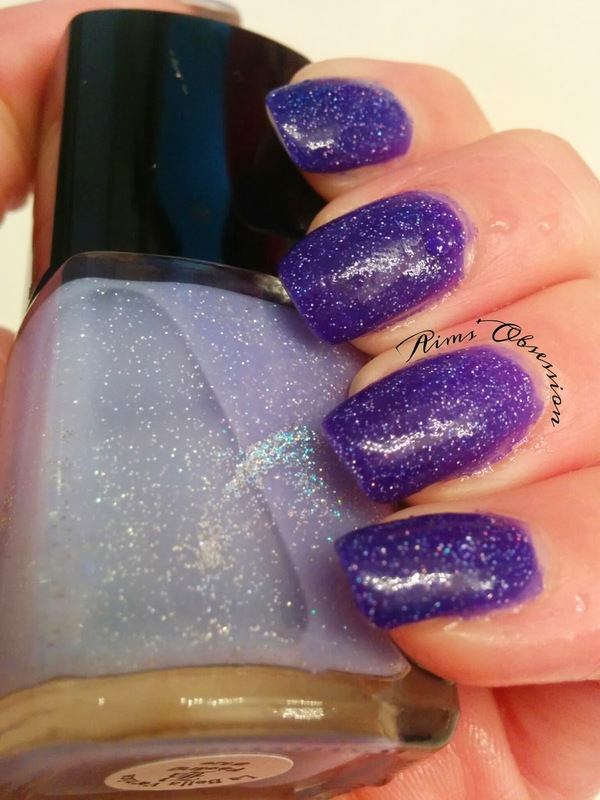 I smoothed over the glitter with a top coat from Gothic Gala Lacquers called "Smooth Me Over." What a cute name!! I did not see this in the store either but if it ever comes available I recommend buying it! 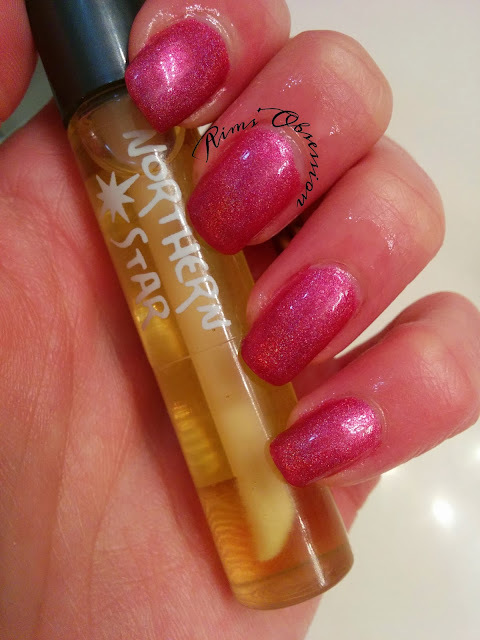 Today on the blog I am showing 2 polishes and a cuticle oil from Northern Star Polish. These items were sent to me for my honest review and I am very excited to show them to you today! All three of these are available to buy on the Northern Star Etsy page! First up is a darker color which I would recommend wearing if you are feeling a bit vampy. This is Choco Love. Choco Love is a milk chocolate colored polish with multi colored flake glitter finish. I actually found it to also give off a purplish tint to it. Do you see it? This look was achieved with 2 thin coats. 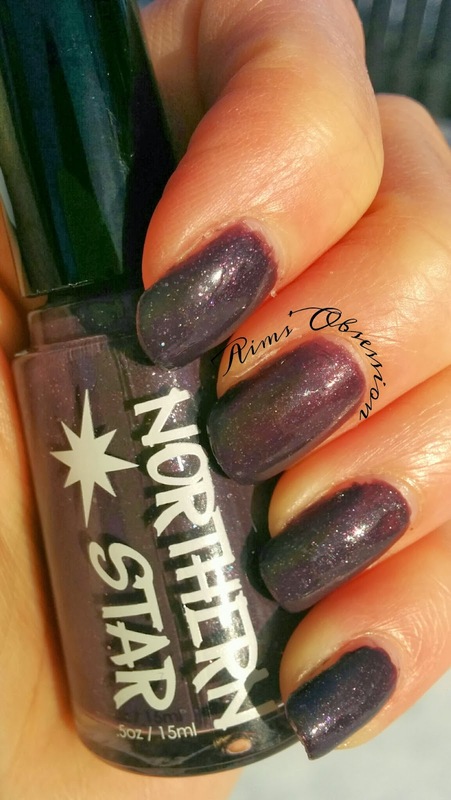 Northern Star Polish has a wider brush, so if you are like me and are used to thinner brushes you may have to be a little bit careful when applying. It goes on very well though and a wider brush = less brush strokes! This is Carnivale. 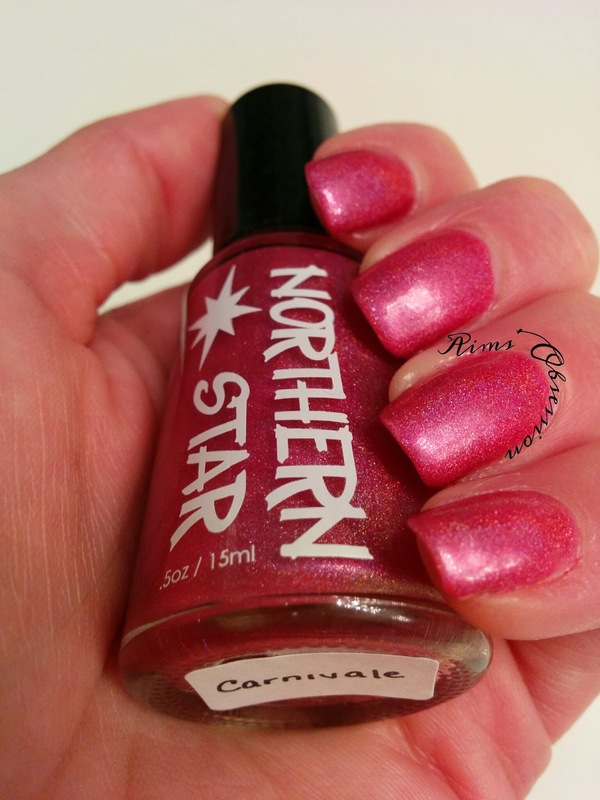 Carnivale is a bright pink polish with linear holographic finish. (OMGGGG HOLO!!!) I was not able to snag some sun shots because the sun hid due to weather. I am in love with this polish. The brush is also a wider brush but I found it went on very well (I had practice with Choco Love!) I only needed to use 2 thin coats to achieve this look. Isn't it gorgeous? 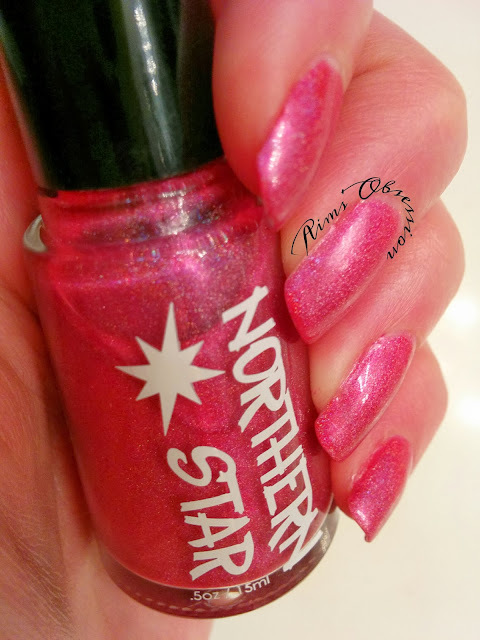 I am definitely going to check out some of the other Northern Star holos! The last thing that was sent for me to review was a Sweet Orange scented cuticle oil. 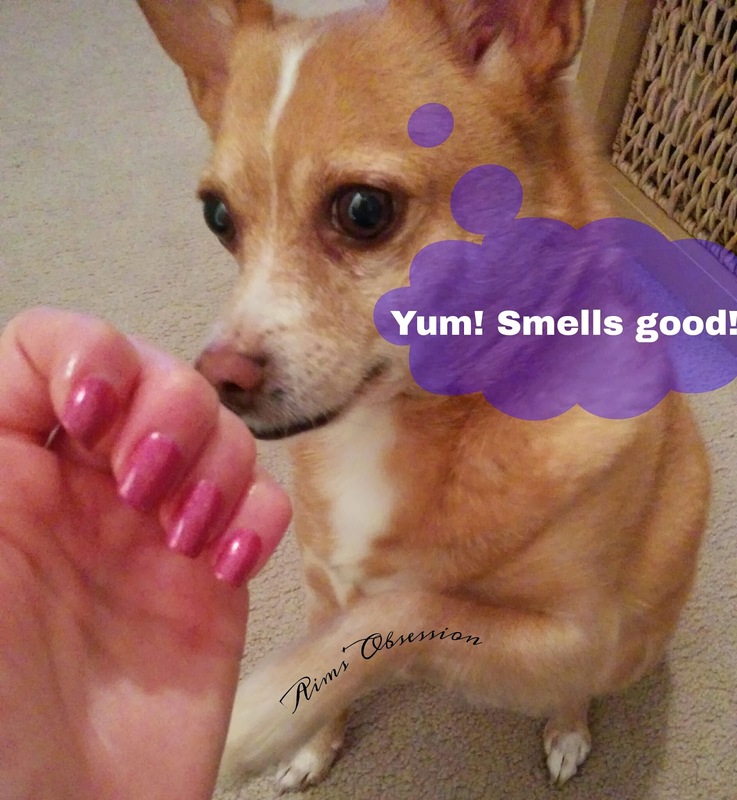 It smells delicious! The size is so convenient! Just like the listing says: you can just pop it right into your purse and go! Did I mention that it smells delicious? Even Nova agrees! 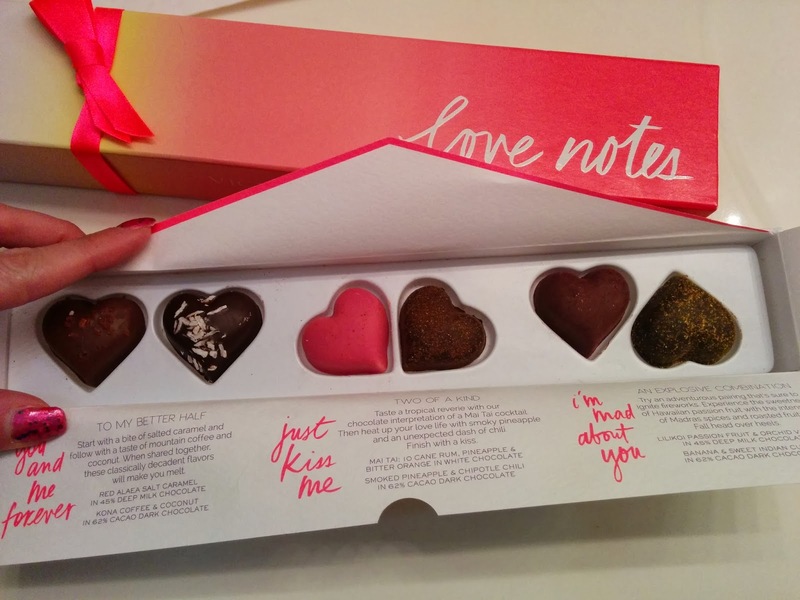 Choco Love and Carnivale are available for purchase for only $8.50 each. The first polish up is Marukyu Striptease. 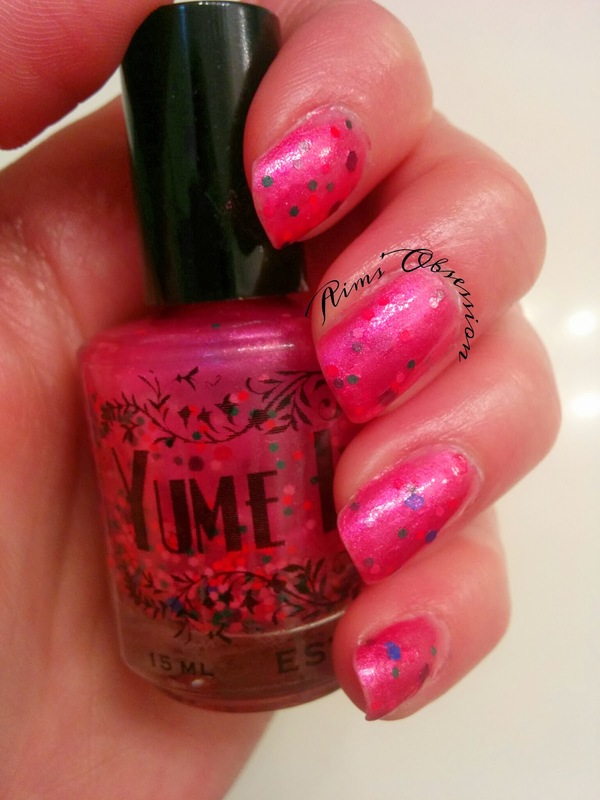 This item is a nail polish based on the character Rise Kujikawa of one of the most popular video games Persona 4. 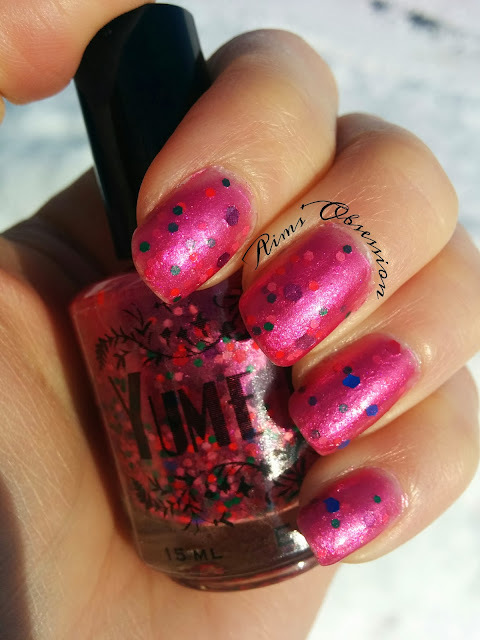 Marukyu Striptease is a jelly-like/holographic pink polish with different sized and colored confetti glitters. 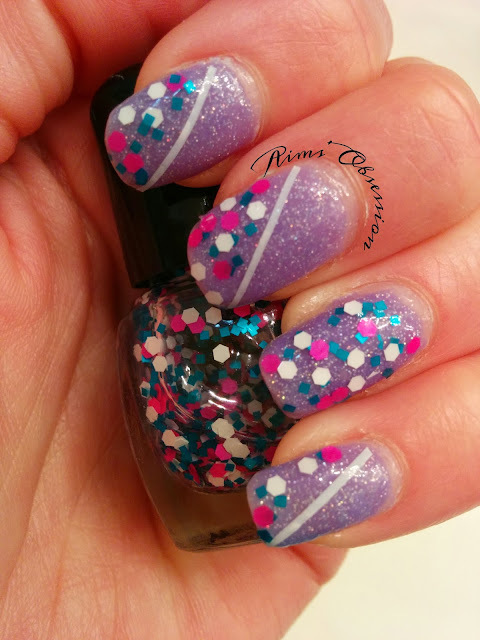 I really love the base pink color to this polish and the multi-colored glitters really add a fun pop to it! I was pleasantly surprised with the how pigmented the base was and only needed 2 coats to achieve this look. I was also surprised at how many glitters the brush pulled out with each application. You really don't have to fish around for glitter with this polish. (Unless you want to place a certain color in a specific spot). Here is a shot of Marukyu Striptease in the sun! Don't you just love it? I wore this polish to the Victoria's Secret Bombshell Party! 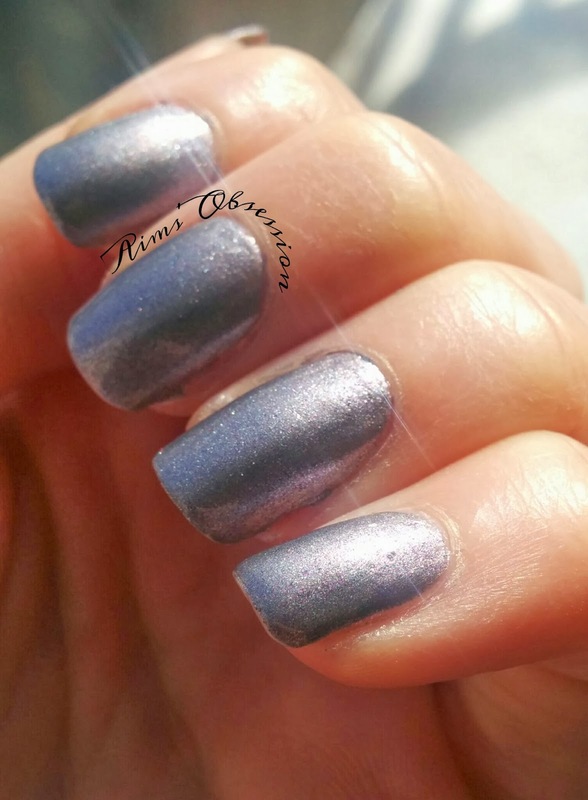 Next up is a polish called Time Distortion. This item is a nail polish based on the character Sailor Pluto of one of the most popular magic girl animes, Sailor Moon. Last up is Gasp! The Enemy! 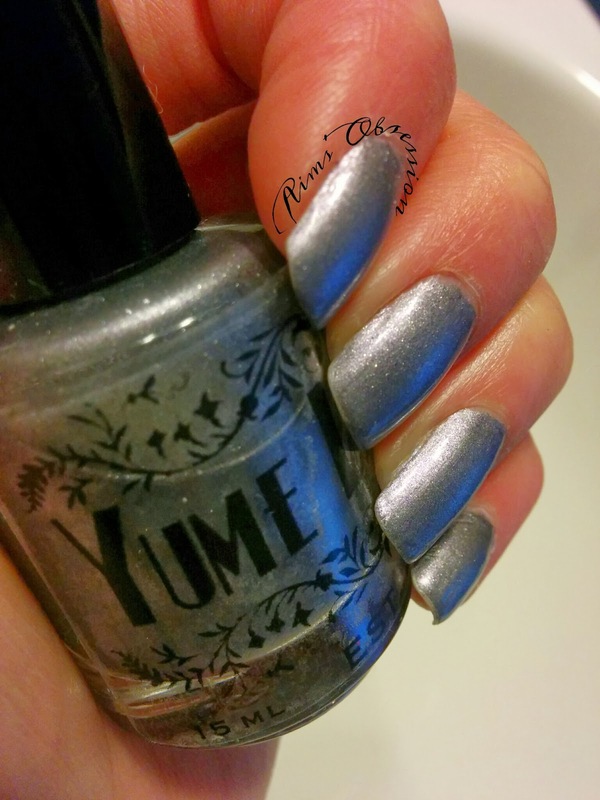 This item is a nail polish based on the character Fuuka Yamagishi from the video game Persona 3. Gasp! The Enemy is a linear holographic aqua color. (You know how I feel about polishes in the blue color family!!!!) 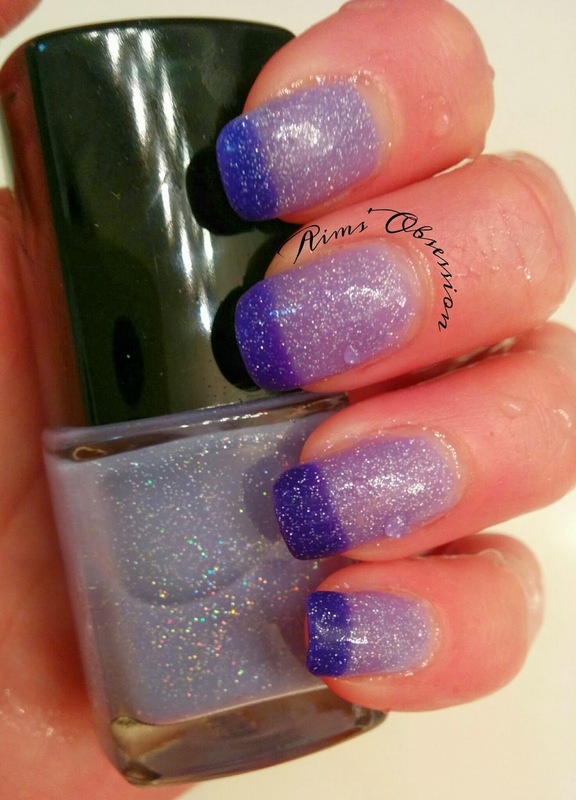 It is super pigmented and packed with holo! (WOOOHOOO HOLO!) I only used 2 coats of polish to achieve this look. Gorgeous! <3 If you want to see more of Yume Lacquer's polishes please go visit her etsy page! These polishes are available for purchase in full sizes for $9.50 each. Don't forget to show her some love on Facebook! 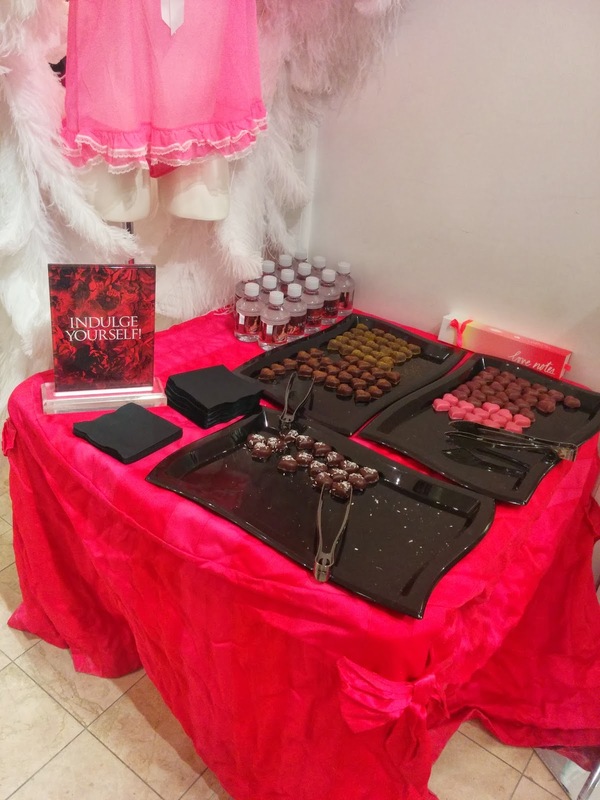 About a week ago I received an email from Victoria's Secret about a Bombshell party. The email stated to RSVP for an after hours party with a live DJ, sensual hand massages, free perfume samples and chances to win prizes. I immediately messaged my friend Rebekah to see if she was up for joining me. The day finally arrived and Rebekah and I drove out to the party wearing our cute outfits and wondering what to expect. Then of course there were chocolates set out for free anyway! Yum! We were slightly bored of walking around in circles in the store, so while waiting for them to call the raffle prizes we goofed off a little. Rebekah's "Good luck Birthday Fairy" came early this month and she won these fun prizes (total worth about a $200)!!!! I ended up buying 2 pairs of yoga pants and some dry shampoo. 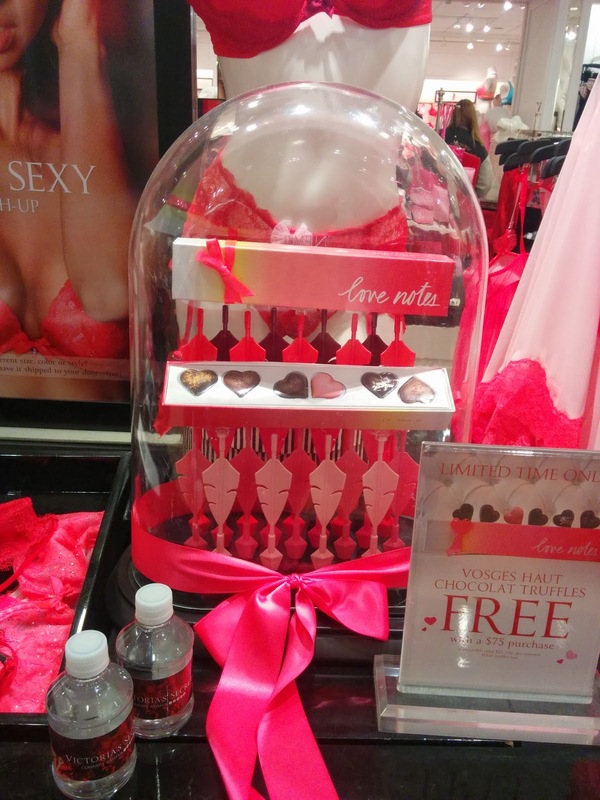 This was more than $75, so I got free chocolates too! Bahaha what a tease! 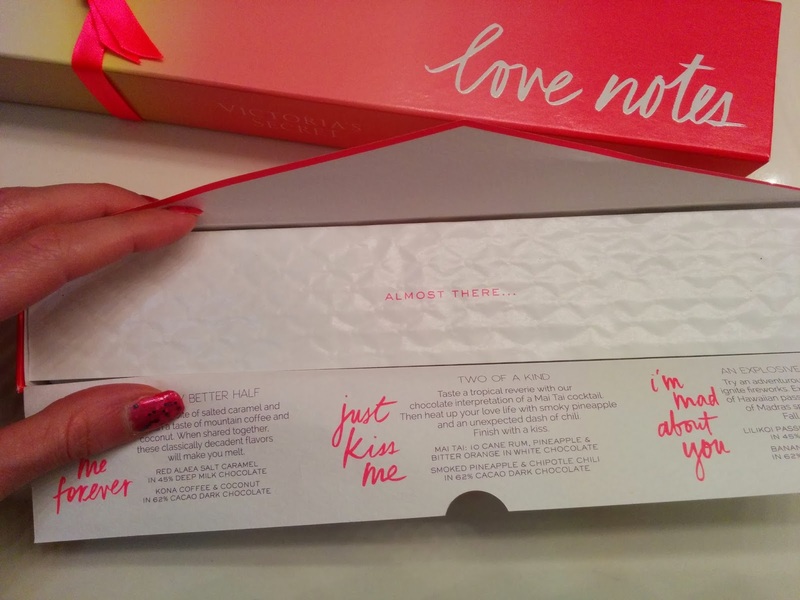 Cute packaging thought right?